Your smile says a lot about you. While a beautiful, bright smile can portray confidence and friendliness, stained or yellowing teeth can keep patients from feeling confident smiling. As a result, these individuals tend to hide their teeth, making them appear standoffish. 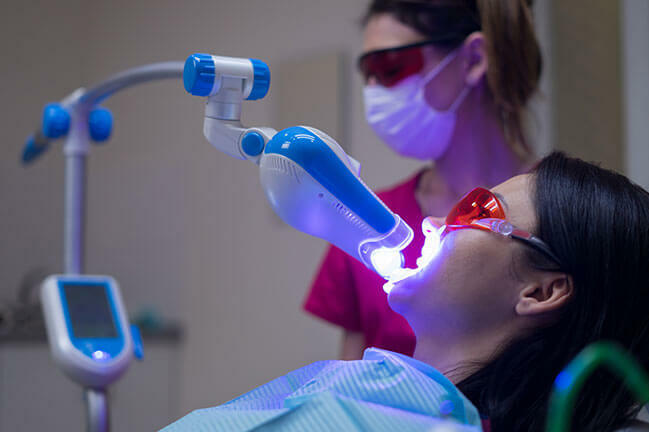 To help patients feel great in the way their smile looks, Chicago dentist Dr. Ogbara offers in-office or take home teeth whitening options to help you achieve a bright and friendly smile. Many people think that stained or yellowed teeth are entirely due to poor oral hygiene. It’s important to brush and floss twice a day to maintain a healthy smile, but there are several additional factors that can make your teeth lose their brightness. Diet in particular is a common cause for discolored teeth. Foods such as coffee, tea, berries, and wine are notorious for staining teeth. The discoloration of your teeth can also be a natural effect of aging or a side effect from using certain types of prescription medication. Certain behaviors can also compromise the look of your smile. Smoking is another major threat to the health of your smile. In addition to staining teeth, prolonged tobacco use can increase your risk for tooth decay, gum disease, and several types of oral cancer. Physical trauma is another factor that can cause your teeth to change color. When you meet with Dr. Ogbara, he’ll help you choose the teeth whitening program that’s best for you. For fast results, many patients select in-office whitening treatments from Zoom. With this professional treatment, you can get your teeth up to eight shades whiter in just one 45 minute session. We also feature Zoom take-home whitening kits. This powerful treatment is safe and easy to use. We’ll provide you with Zoom professional cleaning gel and convenient whitening trays. In a matter of days, you can see dramatic results and the brighter smile you’ve been longing for.